Already we are in July. It is NAIDOC week. A week celebrating First Nations people of Australia. It is a time to remind those of us who are not of these First Nations people to always remember the land called Australia is, was and always will be Aboriginal land. This year there is a focus on women: ‘Because of her we can’. for the stories and their voices. as they gasp with songs unknown. It has been a time of many happenings. There has been a lot of sorrow. There has been some who have found hope in going to the US. One of our long terms members has married. There have been a new publication in the Australian Independent Media Network by Samad Abdul who interviews Obeida on Manus Island, and an article written from detention in Indonesia by Asif Rahimi, Walk with me, then talk about me, which will soon be published in Overland. 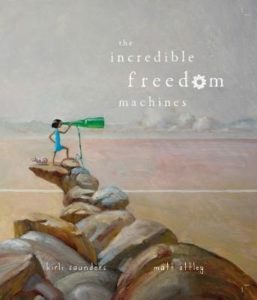 Mohammad Ali Maleki’s new chapbook “Truth in the cage’ has been released, Juan Garrido Salgado has sent in a poem for Selim, Behrouz Boochani’s ‘No Friend but the Mountains: Writing from Manus Prison’ will be launched in Sydney and Perth in early August and in Melbourne in early September. MAFA’s exhibition ‘Global Citizenship’ was held in Space@b in Melbourne with wonderful art work by various artists with women strongly represented. 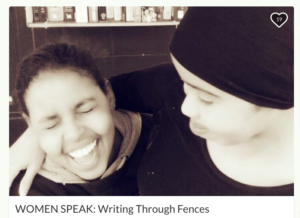 Our Women Speak: Writing Through Fences project, an anthology of writing and art work by women associated with Writing Through Fences is almost ready for printing and we are asking for help with funds for this. 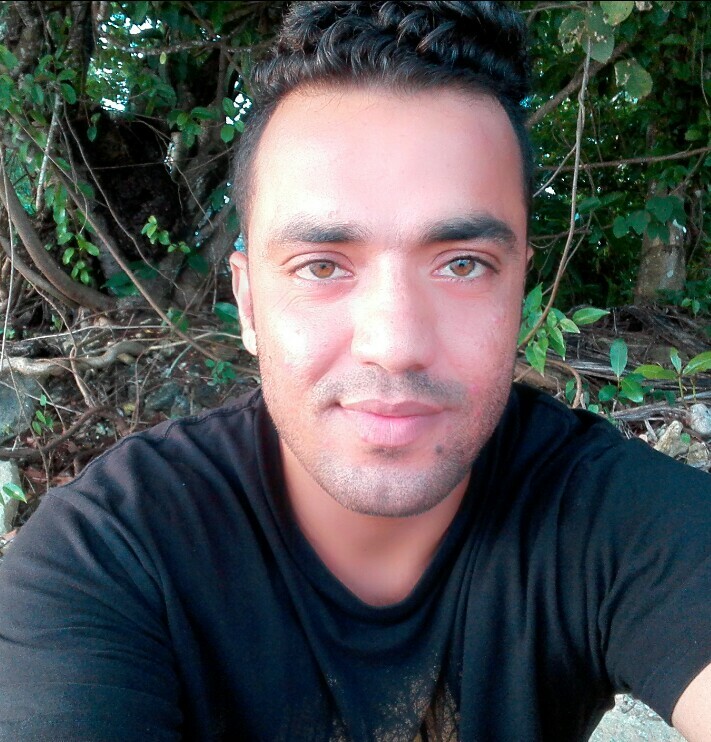 This interview was conducted in April 2018 in the East Lorengau Prison Camp on Manus Island. Samad: Thank you so much Obeida for your time and to be here. I saw your interview which you gave to Janet in 2015 (see link to this interview). I saw that and I read it and it is very painful and I am very sorry for that so my best wishes will be with you. Obeida my friend, first of all I would like to ask you how are you feeling and how is the new accommodation? Obeida: Here no-one gives me help because I’m alone here. Even I asked for help from the security or from anyone here but they didn’t help. First they put me with someone with mental problem. That person tried to set fire to the room when I was asleep. You know, after that I leave the room and no-one give me help. This is what I feel: I feel alone here. Obeida: Yes it is just for now. Samad: So you said you are the only Syrian here and as you are only one person here you don’t have any appearance from your community here. How do you feel to be alone like this? Samad: So I will ask about the 24 days when Australia left us without food, without water, without support and they just left us alone in Lombrum. It was horrible days. It was really horrible days and we are still suffering that pain. Can you describe how do you feel about that, and how did you survive that, and do you have suffering that comes from that? Obeida: You know the Australian government they tried to kill us at that time but they put PNG as the face – little man do whatever they want. PNG they tried to kill us but in the end the media went out. We remained strong at that time and we showed all the world all the pain that Australia does to us. I was feeling not safe because we don’t have parents, we don’t have food, we don’t have water. We tried to contain the rain water and we drink it. Very hard days. 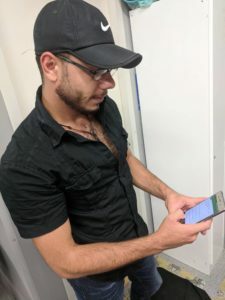 Samad: I want to ask you about, you know … the world knows that Syria is now a war zone and a couple of countries are accepting refugees from Syria, including Australia. I saw in the news that 12,000 people will be accepted by Australian government, whether they are really accepted or not I don’t know! Samad: Yes, it is really unjust. They are taking people from Syria but Syrian people are here in offshore and they are not accepting them so this is unfair. I’m so sorry for that. Obeida: I have contact with my family but you know, with the situation it is very hard. But yeah, sometimes I contact with my family. But just family. My friends, I lost them. I don’t know where my friends are now. Obeida: Some of them is dead, and some of them in prison and some of them … I don’t know. Obeida: I can’t say yes and I can’t say no. Samad: We heard about USA throw some kind of weapons, chemical weapons – we don’t know. Did it affect your friends or family. Obeida: Yeah. No it is a little bit away from my family. Samad: Obeida I have another question. Do you love someone or something the most in your life? Obeida: I love freedom. But I don’t think we get freedom. This is not freedom [to live] somewhere else in PNG. It is not freedom to settle in danger. We will not have freedom in Australia or somewhere else. I loved one girl in Syria so she talked about marrying me and we got engaged. Samad: When you broke up with her how was your feelings? Of course you were in Lombrum then, so how was your feeling? Obeida: Yeah, and you love someone and you cannot see them or touch them for long long time. And after that you lost them. Obeida: You know that time … I think by then its better for me [to break up] you know, at that time. Yeah… but after these long years I try to forget. Obeida: Yes I like to listen to English music sometime. Sometime Arabic. I love to hear the English music more than Arabic. You know sometimes in the night you like to listen to sad music because of this situation you know. When you are happy, you will listen to romantic music or something happy. Samad: One more thing I wanted to ask you about Tiger [Tiger was a young stray dog that Obeida adopted]. He was our friend. Especially for you. Obeida: When I lose him, when I lost my friend I put my heart with him, in the ground with him. I don’t feel myself here. Because when I walk, always Tiger was with me. When I go somewhere, Tiger was with me. Really he’s my best friend. I lost something from my heart. You know I think half of my heart is gone. Obeida: Yes he was everyones. Samad: I am sorry it is terrible news. I hope you find and adopt another dog or something. Samad: I heard you had been taken to Chauka – in 2015 I think. Obeida: You know one time they take me to Chauka because I have – you remember we have one sick man was Syria? He had long time been sick and he had a broken nose from Syria. He was very very sick and I tried to help him. Security were beating him. I just tried to protect his body and security arrest me and take me to Chauka. Samad: He’s been deported or ..? Obeida: Hot day under the sun. Inside the container, under the sun, oh, you know if you sleep its like you swim in the water because of the sweat, you know. They give you only little little food. Not allowed to have fan or air con. Samad: So its a really good thing because your family keep you up and you are strong and still thinking what you can do. So I really hope you can do something for your family and that you can be with them in a safe country. I pray for you. Obeida: I want to help people. To help the people who other people torture them, try to help them, the poor people. This is my dream. Obeida: The first thing I try to bring peace for Syria. I hope the refugees will not be suffering in the compound and in the centre. I love to see the refugees free. To see country like Australia help the refugees not torturing the refugees, not put them in prison, but help them. It’s not a compound. We are in a prison. We don’t feel for one minute we are free. To see the refugees are ok, have a good life. One thing else, I hope that all the world love each other, you know, thinking only about love, not thinking about religion, or the colour, you are black or white. Samad: So you want to do three things for the world. To build peace in Syria, stop the persecution of refugees, like you want to end all the detention centres, people who suffer in detention and the third will be love. You want to make love, no racism, nothing like that, no torture in the name of religion. That’s really inspiring. Thank you very much for being with me today and it was really inspiring to be with you again. I am pleased that you are with me and yes we know the situation and how it is. It is a terrible situation. Mohammad Ali Maleki’s chapbook Truth in the Cage, has been released. Congratulations. ¿Cómo se deletrea la muerte en este lugar llamado Manus Island? ¿Quién traerá un poema encendido como una vela? ¿Quién traerá un clavel rojo como fue mi corazón? How do you spell death in this place called Manus Island? Who will bring a poem lit like a candle? Who will bring a red carnation like my heart was?